– Mrs. Sia Koroma, First Lady of the Republic Sierra Leone. The First Lady was speaking at the one day MHC Conference, which she declared open on her birthday. She called upon ‘professionals to try to develop strategies to effectively deal with the menace of drug and alcohol abuse among youth’. Mrs. Koroma cataloged three milestones confirming Government wants mental health for all, viz the launch in 2012 of the National Mental Health Policy & Strategic Plan, The graduation of 21 mental Health nurses this January, and the inclusion of mental health in the Agenda for Prosperity, linking economic development and mental health. She applauded the efforts of national and international partners in the conference. Mrs. Koroma called for mental disorders from the physical and emotional scars of the civil war to be addressed adequately and professionally, to avoid lasting effects. She stressed the need to ‘address and prevent the stress and anxiety created by rapid economic growth’. Vulnerable groups must not be forgotten, she emphasized, like women facing post-partum depression and/or psychosis; and the children born with developmental delays, and the growing number of aged, giving rise to age-related mental disorders like dementia and Alzheimer’s disease. She stressed the need for more mental health professionals to meet these challenges. Increase in life-expectancy only comes as our country and her health care system develops. ‘We have to strive to consciously change the way our society treats mental health’, she stressed. 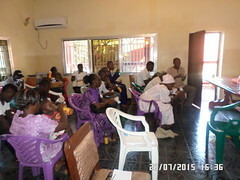 Mrs. Sia Koroma concluded by congratulating the MH Coalition and the sponsors for the event. ‘May we come together in one year’s time and reflect on how today’s theme has motivated even more positive developments in the mental health sector of Sierra Leone’. The Conference was chaired by the Vice-Chair of the MH Coalition, Dr. Gladys Palmer. Salient statements were made by the HON. 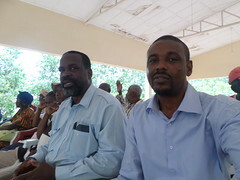 MOIJUEH KAIKAI, MSWGCA; MR. FODAY SAWI, Dep. MoHS II, Mr. Donald Conteh, Head of Specialized Nursing, COMAHS, Dr Alfred Makanjuola, University of Ilorin Teaching Hospital, Nigeria, who was ably represented by the mhLAP Country Facilitator, Joshua A. Duncan; Dr Theresa Betancourt, Harvard School Public Health, USA; Dr. Julian Eaton, CBM Togo; Dr. Andrew Muana; and Ms. Heather Weaver of EAMH-SL gave the vote of thanks. The keynote address was delivered by Dr. Janice Cooper, Carter Centre Mental Health Programme, Liberia. Welcoming participants, Mr. WALTER CAREW, Chairperson of the MH Coalition. advocated for:‘ a ‘campaign for increased national commitment to mental health issues…’, and a strategic networking with government. He urged greater knowledge dissemination on mental health issues to combat the ignorance responsible for spreading the virus of stigmatic and discriminatory behaviour. He expressed confidence of an urgent ‘review of the current Lunacy Act of 1902’, with the support of the First Lady and the two key ministers. The Conference Chair and Deputy Chairperson of the MH Coalition, Dr. Gladys Palmer, called for MH stakeholders to ‘look beyond the walls of the Psychiatric Hospital’ to effectively address MH needs in society. 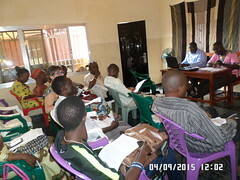 The MHLAP COUNTRY FACILITATOR, JOSHUA A. DUNCAN, on behalf of Prof. OYE GUREJE, NIGERIA, hoped that: ‘the stakeholder’s councils in all the participating countries will evolve into independent and self-sustaining organizations that will outlive the mhLAP.’ and that ‘governments will begin to give appropriate policy and budgetary attention to the improvement of mental health services. ‘…there can be no health without mental health’ (WHO) should become a guiding principle of health planning…’.